I always write about how much I love what I do – primarily because it affords me the opportunity to be surrounded by beautiful posters and prints all day long. The gallery is not only physically beautiful (with abundant light and great floor-to-ceiling windows),but because of our fabulous magnet walls (the walls are actually sheet metal – painted – which permits us to hang even the most enormous posters with rare earth magnets) we can change our interior design themes on an almost daily basis. Getting up the ladder is another matter, but I digress…. We’ve had this poster in the gallery for a while, and although I understood its general message (something having to do with World War One and fighter planes, like these, I was having a hard time identifying the gentleman on the bottom left of the image. As promised, I am getting back to you about the ‘Goliath – Farman’ poster by Georges Villa. From my research, I believe that it has to be a peacetime poster, no earlier than late 1918. The plane was designed and launched in the last year of WW I and, as I understand, did not see combat. If you look at the poster, there is no battles, no war happening and the plane, rather than dropping bombs is sailing over an area that it’s uniting. I think the strings mean the Goliath is linking the countries represented by the three politicians. 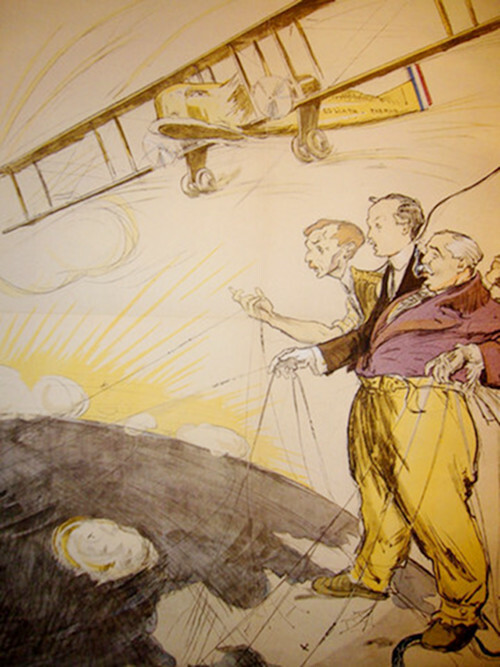 “This illustration by George Villa depicts Henry and Maurice Farman, the two founders of the Farman-Goliath airlines, and the prime minister of France, George Clemenceau. The snake under Clemenceau’s left foot is a reference to Germany under the airplane restrictions of the Treaty of Versailles. Clemenceau’s stands on the snake, symbolizing the post-World War I restriction put on the German airlines . The Farman brothers built their first airplane in 1907. Soon after World War I, TheFarman brothers built the Farman-Goliath twelve passenger, twin engine commercial transport version of a bomber aircraft. In 1919, the F.60 Farman-Goliath airplane, built by Henry and Maurice Farman, made the first passenger flight from Paris to London, carrying 11 military personnel. Next I am a (semi)reformed vintage poster snob….